Martin trained as a concert and recital soloist in the early 1980's and for over 25 years enjoyed a varied career of engagements in both opera, oratorio and musical theatre repertoires throughout the UK. He subsequently became involved in planning and promoting musical events, primarily in support of charitable causes. This led to him becoming a theatre adjudicator, reviewer, after dinner speaker, compere, published script writer and now, a regional Acquisitions Agent and Advocate for the theatrical publisher, Stagescripts. Martin now specialises in theatrical script writing and having completed a number of pieces, is now working on several new plays. He is also happy to hear from anybody who is interested in collaborating on new projects and also, writers who are seeking to publish their works. Finally, if you are a Festival organiser interested in engaging an Adjudicator or a theatre company who need a performance reviewed, get in touch! Just browse the pages of the site to find out more. Looking for your next production? Looking for a publisher? Martin is contracted to the Theatrical Publishers, Stagescripts. 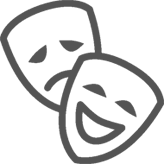 Stagescripts Ltd is an independent publisher and rights-holder for the works of mostly contemporary writers and composers of musical theatre and drama, serving the needs of adventurous and innovative producers. As well as acting as their Acquisitions Agent (looking for new works and new writers for the stage), Martin is an Advocate, giving advice about their catalogue and finding the right play, musical and pantomine for you. Let him help you take the pain out of picking that next production. Get in touch using the contacts page or visit the Stagescripts website. Are you looking to engage a Theatre Adjudicator? Are you organising a One Act or Full Length Drama Festival? Would you like your first night/preview reviewed? Or do you want to have a trusted, objective and respected critic evaluate your production and publish the same night via social media? You are only as good as your last production. Let a comprehensive, detailed and honest review help in telling your story and showcasing your talents. Use the Contacts page or click below to find out more. SOUL WITHOUT END: A young woman and her uncle escape the ravages of the second world war and take refuge in the ruins of a French Chateau, inhabited by the owner and a small group of soldiers from apparently different sides, who appear to be also seeking refuge from … what? They soon come to realise that it is not only people who have memories. So do places. And the reasons are darker, much darker than they could possibly ever think. WHERE IS THE LIFE? A bitter sweet drama about The Beeches residential home for 'retired gentlemen of the stage'. They have come from a bygone world and have now created a new world which is bound together by images, reflections, memories, longings of the past but equally, yearnings for a future. And when Kelly the new Care Assistant arrives, everyone's world is placed in turmoil as they all learn about themselves, loss, love and what really matters.